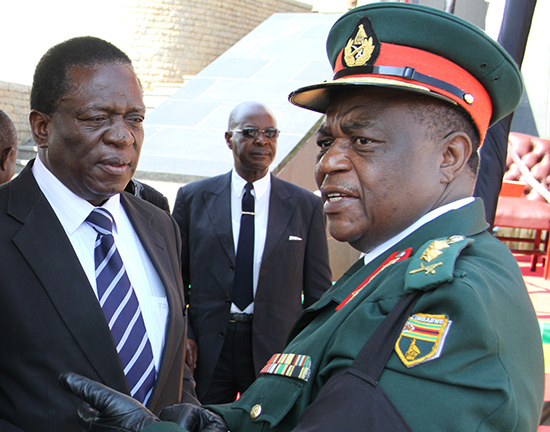 COLOGNE – Zimbabwe Defence Forces (ZDF) Commander, General Constantino Guveya Chiwenga, is set to be granted special powers when he assumes the office of Vice President of Zimbabwe any day from now, to help his imminent boss, VP Emmerson Mnangagwa, all but about to become the second republic leader to stabilise the political and economic situation in the country ahead of the 2018 presidential and parliamentary elections, Spotlight Zimbabwe reported. The disclosures come at a time when there is growing social unrest and discontent, characterised by street protests and demonstrations by rights activists, as political analysts are warning that Harare risks becoming a failed regime, due to the country’s multiple social and economic woes bedeviling the populace. Also President Robert Mugabe’s exit from office, might trigger stratospheric political chaos and civil disorder, breeding fears of anarchy as people are “going to be tempted to test the powers” of any incoming regime after Mugabe, government insiders said yesterday. According to a current serving cabinet minister, with knowledge about the behind the scenes developments, Chiwenga is going to be vested with more responsibilities to manage, the security element of the new government, whose tenure is expected to be shortlived. Opponents opposed to Mnangagwa taking over the presidency, have raised alarm that his administration if it comes to power, will give birth to a securocrat state. A securocratic state is one in which the military-security apparatus is a dominant factor in the power complex that is the state. Zimbabwe’s main security ministries, include defence, home affairs and state security. Ministers Sydney Sekeramayi, Ignatius Chombo and Kembo Mohadi lead the crucial portfolios respectively. The minister said Chiwenga will not find it difficult to deliver, as he has been a key member of the Joint Operations Command (JOC) for many years. Spotlight Zimbabwe was the first media publication in the country to break the story of Chiwenga’s pending shock elevation to be first vice president on 18 March 2016. Zimbabwe has never had a vice president, taking over from an incumbent leader since Independence from Britain in 1980. Closer to us across the Limpopo, Thabo Mbeki, then vice president during Nelson Mandela’s reign managed to succeed him in 1999, as promotion to his appointment as deputy president in 1994.